After a breakdown leaves Katie expelled from her dream school, she is left struggling to pick up the pieces - And when an opportunity to babysit for a wealthy family on the outskirts of town presents itself, Katie sees it as the perfect way to prove how much she's moved on from the unfortunate incident. Regularly they ask me if I could watch an independent movie and write something about it so that it gets some extra attention. I got an email from Greg Klepper, maker of the short film “The Babysitter“, with a rather poignant message. Apparently, this film was shunned by the festival circuit because of its playing time. A project Greg Klepper worked on for more than a year, with heart and soul. And to make things worse, Netflix also came up with a film with the same title a year later. Needless to say that the man is all broken up. And therefore his cry for help. No problem. I spend some free time watching this and if it is not too terrible for words, I will also reserve some space on my blog to tell about it. The fact that you are reading this, says enough. 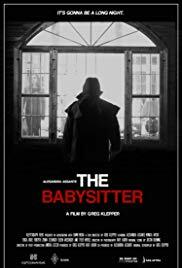 The description given by Greg is as follows: “The film is a kind of a Polanski-esque, Hitchcockian black and white psycho-horror thriller with 90’s teen slasher elements and a killer twist at the end.“. I don’t agree completely with the description, but in general, it’s true. It does have the atmosphere of 80s slashers such as “Halloween” (by coincidence I’m writing my opinion about the “Halloween” movie of last year) or more recently “He’s out there“. Only the argument that the film contains a “killer twist” is somewhat exaggerated. First of all, I must say that I can only applaud the choice of showing this short film in black and white. Even though that choice gives the film an old-fashioned look, films in this simple color form have a special charm. You’ll enjoy the play of light and shadows. And to be honest, I generally liked the footage. The way in which the film was edited and the different camera angles also gave it a professional appearance. The setting where most of the story takes place looks peerless. A beautiful location. Pills and wine. Not good! The house belongs to Armand Assante (known from “Judge Dredd” from 1995 and “Gotti” from 1996). Armand is the father of Alesandra Assante, the beautiful appearance that was given the leading part of Katie. It’s clear where she has her acting talent from. And if you observe carefully, you also see some resemblance with her father. Alesandra is such a typical character who recuperates from a traumatic situation (I presume) and is taking the right prescribed medication. When you see her swallowing some pills with the help of a glass of wine, you know that this means problems. In similar films, the boundary between reality and hallucination is reduced when this occurs. Yep, she’s a knockout all right! Next, you’ll see Erica Duke Forsyth as Cara, Katie’s best friend and not exactly the most intelligent being on earth. Even if her I.Q. would be seriously high, I wouldn’t have noticed this immediately, because of her deeply cut décolleté. But make no mistake. That’s not the only thing she can shows off with. During the denouement, she demonstrates some other talents. She’s a ravishing appearance I wouldn’t refuse a date from. Besides, she is also the only one who brings humor to this film (“I almost read a book”). But the most intriguing character is that of Tyler Merell. She looks like a kind of Cruella de Vil with that elongated face and that outspoken make-up. It’s no Hitchcock but it’s far from bad! Words of praise indeed. But I would also like to add a critical note. I understand that it’s not easy to bring a broad drawn-out story in such a short time frame. That’s why it probably feels a bit incomplete. There’s no further elaboration about Katie’s father. And I also wondered why all this was staged. What was the goal? Where did little Noah go? Was there even a little Noah? Or was it all just one big hallucination? Well, there are more questions that arise than that you get answers. That’s kind of frustrating. But doesn’t this also occur in big-budget feature films sometimes? The only thing I want to ask, dear film lovers, is to click on a link below and give this short film a chance. It’s certainly not a Hitchcock and it feels unfinished in a certain way. But it’s far from bad.